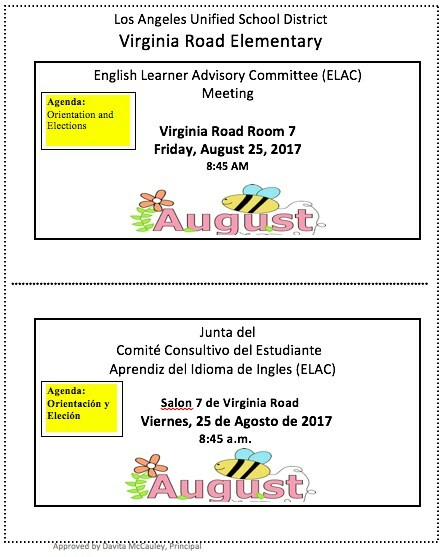 The English Language Advisory Committee (ELAC) is a meeting place that parents can use as a platform to express their concerns and ideas to both the school and the district, to inform the decisions of the School Site Council. Children benefit by ELAC as their parents' concerns are voiced to the School Site Council, resulting in an impact on decisions at both the school level and the district level. They will see the change in their parents, as the parents are empowered by the trainings they will receive, and as they develop the ability to speak out for their families. ELAC offers workshops that cover broad areas, such as legal issues involved in working with English Language Learner students, trainings in reading and homework techniques that can immediately help their children and trainings in dealing with different family problems. ELAC provides parents with a forum to express their thoughts and concerns about their children's education at the site and district level. Parents have more expertise about their children's education than they realize.